Yes, a man has vowed to go for one whole month only eating bacon! I don’t normally post twice in a day, but I thought this deserved the mention! According to this Slashfood post, Michael J. Nelson will eat only bacon for an entire month. He is also going to only drink water and not use any condiments. You can read his original blog post here (from January 31st). He apparently decided to eat bacon during the SHORTEST month of the year! You may or may not recognize the name, but he isn’t just a “normal” guy. He was the SECOND host of Mystery Science Theater 3000!! I loved that show. I wish you luck Mike! I hope you do because then I have something amazing for you…Baconnaise! 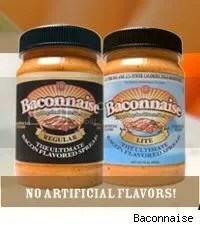 That is right, bacon flavored mayonnaise! This new product is launching soon according to this post at slashfood.com. If you are a true Bacon aficionado I’m sure you are already well aware of Bacon Salt. Bacon Salt has been featured a few times during recent Woot Off’s! Also according to that post there is going to be a launch party in Seattle on Thursday featuring a wrestling match between a slice of bacon and a jar of mayonnaise! You gonna go Kaiti and Charlie?